Saw this at a shopping mall yesterday. It sure caught everyone's attention. 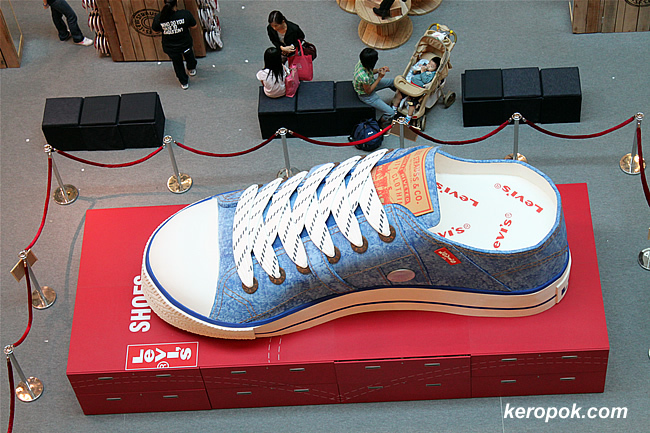 Probably the biggest shoe in Singapore. The only things Levi's I have are jeans. hehe, i notice s.g people like biggie things, you got the big pepper(on your last post), big bar of ice cream display in d.ghaut mrt and now, this! Lol! It must belong to Bigfoot! It would be pretty hard "to fill those shoes!" well.., if the shoe fits! haha... bigfoot will think we are all ants. wonder if it's in real sizes, what size would that be! really didn't know Levi's has shoes! F1 from the Singapore Flyer..